Gung Haggis Fat Choy Pow Wow Dinner! Shelagh Rogers has impecable timing. Here CBC Radio flagship show moved to Vancouver in 2004 and asked if I could present a gift for Shelagh. I created haggis won ton to represent the youngest generations of my family who are of mixed race heritage. 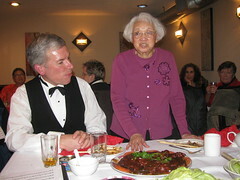 In 2005, Shelagh came to co-host Gung Haggis Fat Choy Dinner. 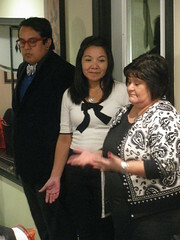 Recently, Shelagh has been hosting Reconciliation pot luck dinners between Aboriginal and non-Aboriginal people. We hosted a fireside chat at Kogawa House with members of the Japanese, Aboriginal and non-Aboriginal community. In a conversation, we came up with the idea that could include the three pioneer cultures of First Nations, Scottish and Chinese. I called it Gung Haggis Fat Choy Pow Wow Dinner. Shelagh loved it. 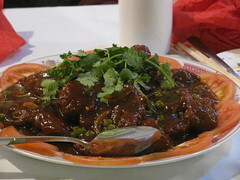 On January 23, 2011 – It became a reality at Iron Wok Restaurant in Victoria. 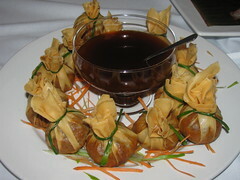 Here is a new twist on our famed haggis & shrimp won ton appetizer dish. 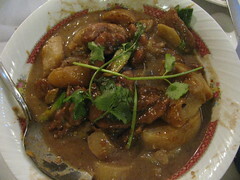 It is served with a special sweet sauce flavored with orange. 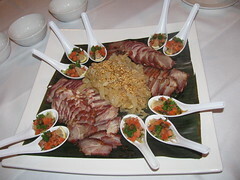 This appetizer plate of BBQ pork and jelly fish, included spoons filled with smoked salmon marinated with citrus flavors. 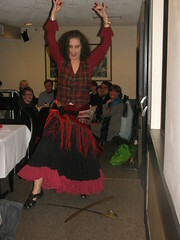 Lynette shared her Lebanese-Celtic-Canadian heritage by doing a celtic sword dance after a performance of belly dancing, with the sword balanced on her head. She is wearing a vest featuring the Maple Leaf tartan. 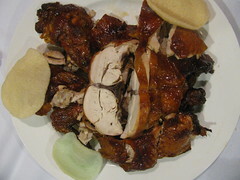 We called this dish Gung Pow Wow chicken – very tender! 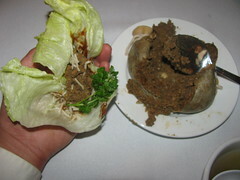 Here I am making up my haggis lettuce wrap. 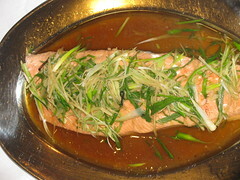 Wild sockeye salmon seared with hot oil, ginger, green onions and soy sauce – yummy! The Jim family shares an offering of thanks for the food and friendship. Bagpiper Allan McMordie and my 95 year old Grand-Auntie Helen, who lived in Nanaimo as a child with her grandparents Rev. and Mrs. Chan Yu Tan. Rev. Chan ministered at the Chinese United Church in Nanaimo, as well as Victoria, Vancouver and New Westminster. In Nanaimo, he also looked after the miners in Cumberland. 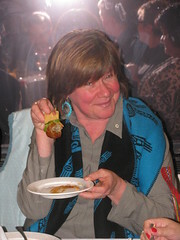 The Shelagh Rogers dessert – a fusion of Scottish, Chinese and First Nations flavors. 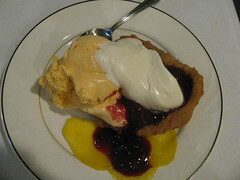 Blueberry sauce on sliced mango and bannock, served with mango and green tea ice cream. This entry was posted in Asian Canadian Cultural Events, Cultural Fusion, Food & Restaurants, Gung Haggis Fat Choy Pow Wow Dinner, Main Page, Multicultural events, Robbie Burns Day, Robert Burns & Burns poetry, Scottish, Gaelic, Irish Celtic events and stories, Vancouver Area Adventures on January 28, 2011 by Todd.